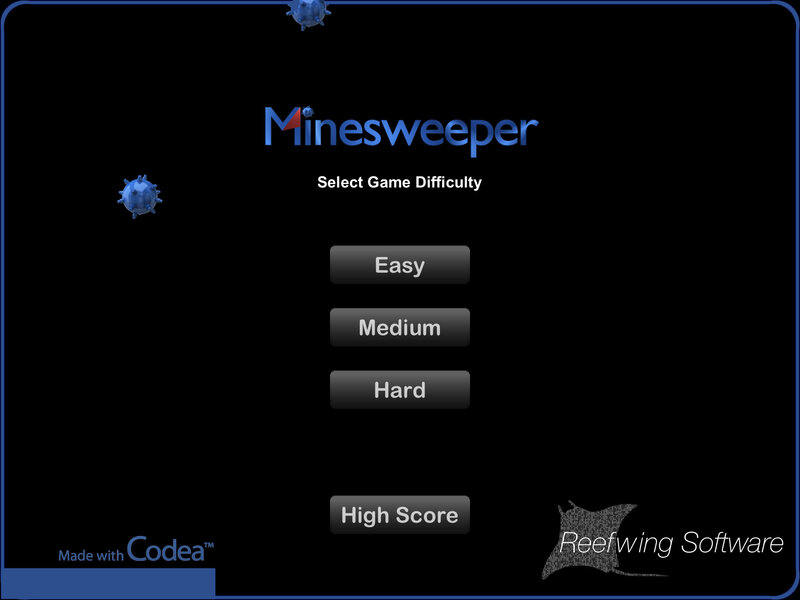 iMineSweeper Game Approved in iTunes! How exciting - my first Codea App was just approved by Apple and is available now on iTunes. Even if you don't want to play it, do me a favour and download it anyway to help with its ranking and don't forget those five star reviews. It's in the UK store. Just downloaded it from the German store, works like a charm! The one thing I don't like in your game is the logo. Congratulations on getting it approved, @Reefwing! Downloading it now. And thanks to all of you that have downloaded - currently ranking 348 in the US store (Games/Strategy category). The thing with my game is I don't think people are going to want to buy it for $0.99. 2.Or release it as paid and make it free with ads later? I could also release it as free for the first week of its release, kind of like a promotion. then make paid, and then free ads. Do you pay the Apple 99$ anual fee to get it inside ? Think it is a bit expensive for free Apps only. Loaded on the french store. Put 5 starts. Good luck! Looks nice. Same goes for the tutorial. It is great that Codea has such an International following.
.@West - Thanks for reporting. I haven't been able to replicate it yet. What difficulty level were you on and what sort of iPad do you have? And thanks for downloading. I will publish the download volumes once I get a few days worth of data.
.@PTN - much appreciated and thanks for downloading.
.@veeeralp - There are a number of different ways to "monetise" (is that a word?) your App. I will do a tute on this at some stage as it is a big topic. My next step will be to add iAds to MineSweeper, however, I'm doing it mostly for the educational value. iAds works best for Apps that people use more than once (the more the better as you get paid by impressions and click throughs). So it is quite well suited to games. A few of my other Apps are use once (e.g. LifeAudit) - I have iAds on this but get hardly no return. What has worked best for me is a free initial App with inApp purchase (Personality Profile) or a relatively expensive up front price (e.g. LifeGoals which sells for $4.49 on the Australian store). These two Apps contribute 83% of my profit. I then did a standalone version of the inApp purchase from Personality and sold that at 0.99c. This contributes 11% to profit and was a good return on my time since the code was already written. Maximising downloads and maximising profits are not necessarily the same thing. A higher price can produce more profits but you need a product which is worthy of that price. Unfortunately, there has been a bit of a race to the bottom from a price perspective with regards to games so unless you have something special, people don't expect to pay more than 0.99c. This has driven a new model called "freemium" (http://en.wikipedia.org/wiki/Freemium). This is similar to what I do in Personality, give away the App but then charge for upgrades or consumable items (e.g. coins or extra lives). This has been very successful for some folks. I don't think there is a one best model, it depends on the situation and keeps changing as everyone jumps on the bandwagon of what works. I wouldn't worry too much about upsetting folks, no matter what you do you will upset someone. I'm guessing your objective is to be able to make your hobby self funding. Giving your App away for free is one way to increase downloads (as you have reduced the barrier to entry to nothing) but it is not the only way. Marketing your App can be just as effective - assuming you have a quality product. My suggestion would be to start off with it free and see what feedback and download volume you get. You can suggest that this is an initial sale period in your iTunes description if you want. If the game has the potential for upgrades or premium features you can then add that it with subsequent releases. If you are going to implement iAds at a later date I would also add some new feature for free to rationalise the inclusion. As to your other questions, the Apple ranking algorithm is a bit like the google search algorithm. Everyone tries to game the system but in the end it is probably easiest to focus on writing a fun game, updating it frequently and marketing it well. It is not so much first day downloads which are important but trying to maximise your downloads over a short period of time (which is easiest to do at launch). This will catapult you up the rankings which has a positive feedback mechanism (i.e. the higher your ranking -> the more your downloads -> the higher your ranking -> etc). The holy grail is to be featured by Apple in the iTunes banner or "New & Noteworthy" section. My experience is that this has a 10x effect on downloads. You can get a similar boost through someone notable writing a review of your App. You can also do what I do and shamelessly promote your app on this forum and to all your friends on facebook (insert social network of choice here). This helps boot strap your rankings. Everyone here is a supporter of Codea so the more Apps written by Codea on iTunes the better. Theoretically this should have the side effect of improving Codea sales which allows Simeon and the crew more time (and incentive) to keep improving the product. My final suggestion would be to build into your App the ability to easily rate and share your App (e.g. game centre makes this very easy now). You can always add this to the next version. Release early and often is my mantra (bug free if possible!).
. @Reefwing wow. I didn't expect that response. This was really, really great advice. I can't thank you enough. iAds really caught my eye because I could make my app free, yet still make a little bit of money off of it. The only problem here, is that I don't know how the iAd revenue would compare to the paid app revenue. In-App purchases are also great, but I don't think you can put those in codea projects. If I could, I would do that and make the in app purchases be more game modes. I completely agree with you on the fact that people don't expect to pay more than 0.99c. Paid games get less attention (sometimes) and people would more likely install a free version of the game. Considering this, I want to make a free version of my game in the future. The free version would have less game modes and it would also have ads. It would also benefit me b/c im using the same code and just removing some functions. This could also drive sales to my full version if people like it that much. Marketing is something I'm definitely looking into. I already sent an email to a website about my app and I didnt get any response after almost a week. My other plan is to just put a post on Reddit (the front page of the Internet) about how I'm a 15 yo developer who just developed my first app. If it doesn't work, atleast I tried. My family/friends will also help because most of them have iPads and they know what I'm doing. I just have one quick question, do the people you give promo. codes to count in your downloads count. If it does, that would be great. The international Codea community could help in that. My main goal for developing right now, is to make enough to continue on my hobby ($99/year). I think the best choice for me right now, is to price it at $0.99. It's not too expensive but it'll definitely help. A free, but limited version is where I'll put the iAds. edit: promo. code redemptions to not count toward downloads. sigh I was hoping international redemptions would help me get actual buyers. Now that I think about it, I don't think anyone will know about my app the first day it's release besides my friends, family, and you guys. So if you can, please buy my app because I want to save promo codes for marketing reasons. Buying my app will help me continue my hobby and rank up in charts. Thank you!
. @MarcosCapistrano - thanks for downloading and nice catch on the bug. It is caused by repeated calls to the touch handler so not strictly speaking a bug but not ideal either. I will fix it up in the next version.
.@veeeralp - To give you an idea on iAds revenue, Personality gets over 100 downloads per day and I estimate is used for a couple of minutes. I get around 50 cents per day from this via (iAds) and roughly $5 per day from inApp purchases. I think your goal of getting at least $100 per year is very achievable. You probably will need to have a few Apps out there to ensure this happens. You never know which ones are going to be successful. At 0.99c you need to sell 143 Apps to hit your target (allowing for Apples cut of the action). You get a new block of promo codes every time you release a new version. I wouldn't worry about running out of these. @ReefWing iPad 3. The bug appears in landscape mode for both easy and medium. At a guess I would say the y coord of the text box appears offscreen for the landscape mode - maybe hard coded? using the TextBox class from Spritely. So it SHOULD work ok. Looks like a good excuse to buy an iPad 3. As an aside: 22 downloads in day 1, 471 in day 2. Now ranking 128 in the US store. With the spritely TextBox class. If you run in portrait then turn to landscape the TextBox disappears. Running in landscape to start with then turn to portrait offsets the TextBox. This is consistent with taking the width and height from the initial orientation.
.@Reefwing 471 downloads in 1 day. that's crazy. how did you climb up that fast. did you market anywhere else besides here and facebook. i think you just changed my mind to make the app free the first couple of days. this is will help me rank up in charts and will lead to unknown people downloading my app later on. Congrats, @Reefwing! Minor suggestion, draw the falling mines in the intro page further upwards so they appear offscreen and are already falling by the time they enter the screen. PS I got a shock when the mine blew up... Guess I was getting into it!
. @West - I understand the issue now. I misunderstood what you were saying. You are correct, I don't recalculate the textBox position when the orientation changes. I hadn't considered this test case. I will fix it up in v1.5. I thought this was such a simple program that I had tested all eventualities - it just goes to show... Lucky I'm not doing the software on the Mars robot. Thanks again for pointing it out. This is another advantage of developing with Codea, the fantastic support network. I will need to think up another excuse to grab an iPad3. My hesitation is I think another version may be coming out in a few months - I hope it doesn't have a smaller screen though.
.@veeeralp - just marketed here and facebook. Making it free does make a big difference, I'm not sure that many people would pay 0.99c for another MineSweeper clone.
.@Fred - thanks mate. Good idea re: the mines. I really like the physics capability of Codea, it is one of those wow moments when you see it working for the first time.